Following last week's album announcement, MARTY FRIEDMAN is now set to unveil his headlining tour in support of his latest scorcher, Wall Of Sound. The 22-show trek will feature support from Houston's top progressive outfit, SCALE THE SUMMIT, along with Madison, WI-based technical progressive three-piece, THE FINE CONSTANT. The tour kicks off in Philadelphia on August 2, just two days before Wall Of Sound is released. Friedman comments, "We`re coming to you direct from Tokyo, to make you smile or make you cry, or even drag you up on stage with us. What`s for sure is that we will definitely get your blood pumping." About the band, in Friedman's own words: "Kiyoshi is the most aggressive bassist on the planet. You will either fall in love with her, admire her skills or both. Jordan Ziff is an up-and-coming guitar superstar. The youngest of the select few who have played beside me in the band. Anup Sastry (on the first week of the USA tour) played drums on Inferno as well as Wall Of Sound, and is the most innovative young drummer I`ve ever seen. Chargeeee (on the remainder of the USA tour) has been my touring drummer for 8 years - he steals the show from me every night. He has an inhuman amount of energy." US fans who preorder Friedman's new album at Prosthetic Records' official store will be entitled to a VIP meet and greet for one of the dates below. Preorders are available here: http://smarturl.it/MartyFriedman. Once ordered, please email martyvip@prostheticrecords.com with your order number and what date you would like to attend. Please note, tickets to the show will still need to be purchased. The pre-order VIP offer will expire on June 30th at which time VIP packages will only be available at www.martyfriedman.com. 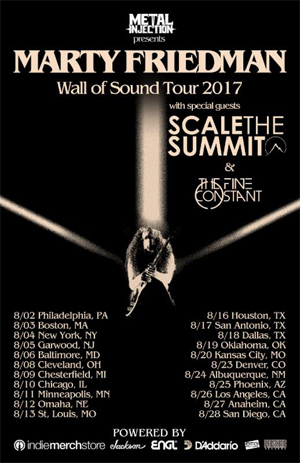 Houston's SCALE THE SUMMIT is one of the most well-known and critically acclaimed instrumental progressive bands out there. Having toured with DREAM THEATER, PERIPHERY, CYNIC and many more, they recently released their sixth album, In A World of Fear. Guitarist Chris Letchford commented, "Can't wait to hit the road this summer playing our new record with such a guitar legend!" Madison, WI-based THE FINE CONSTANT is led by guitarist/artist Sarah Longfield. The instrumental progressive band has released two full length albums to date. Longfield comments, "Nothing compares to being on the road and playing music every night. You meet so many incredible musicians and people. It's like cramming a lifetime of experience into a couple weeks/months!"